You may remember Lautaro Grinspan from the stories he shared with this site about being a ballkid for the Sony Open tournament in Miami. Lautaro is at Roland Garros. Here’s his dispatch from a rainy day. A veritable torrent of emotions swept through my mind as the Line 10 metro I rode arrived to Paris’ Roland Garros station, effectively dulling the sound of the train’s hisses and shrieks, and making seem distant the excited crooning of the French tennis fans around me. I felt panic, as my raincoat-clad self had taken a look at the day’s weather forecast and could not help but fear the occurrence of a complete washout of play. I felt excitement at getting to attend not only a slam, but the slam that got me interested in following professional tennis (the 2004 four-semifinalists-are-all-Argentineans craziness even affected nine year-old me). I felt melancholy as I harped back to the 2006 edition of the tournament, when my dad took me on a now much-forgotten visit to RG in the honor of my 11th birthday, back when we still lived in France. I felt more excitement as I happened to turn 18 that day too (all the cool kids spend their 18th birthdays watching tennis, if you were wondering). As I stepped out of the metro station and (as less stalkishly as possible) followed more knowledgeable fans to the Roland Garros complex, I sustained a pleading glance at the overcast sky above. The day, I realized, was going to be about not letting the weather (or anything else) burst my bubble. With no further ado, find below my takeaways from my visit to RG, listed in a partly chronological but mostly random way. Roland Garros is undoubtedly a place of class, where ivy-covered stadiums, visually lovely red clay courts, abundant and beautiful greenery, statues, flags, and more harmoniously combine into aesthetic perfection. Treading on the site’s patterned walkways and looking about, one cannot refute the wondrous sense of history RG exudes. Indeed, tradition, history, and relevance are most palpable entities at the tournament. The courts themselves were also just great, beautiful places to watch tennis in, all the way from Chatrier to the smaller courts. 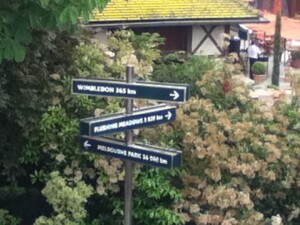 Plus, I could tell exactly how many kilometers away all the other Grand Slams were! How useful! Even to one of the most easily-enamored tennis fans, flawlessness is hard to achieve. “Rolly G,” as a certain Mr. Murray put it, is no exception, mainly because of its small size. Indeed, it simply felt too crowded at times walking around the grounds. The numerous rain delays only exacerbated this problem, as with no tennis being played, everyone left the courts and tried walking about. The ensuing congestion brought me back to my rides in the Beijing subway two years ago. Nothing should bring me back to my rides in the Beijing subway two years ago. Plus everyone had umbrellas open. There were points where nobody could move. As I stood motionless being poked everywhere by others’ umbrellas, the need for an expansion was more than clear. Oh, and, of course, a roof over Chatrier would be a gift from God. After six years of attending the Sony Open in Miami for many days each time and getting to know the place like the back of my hand, it was very weird to me not knowing anything about the layout of Roland Garros. I had to get a map. I had to get directions. This was a personal, pretty stupid problem of mine, I know. It’s just that it’s always been me telling people where stuff is! 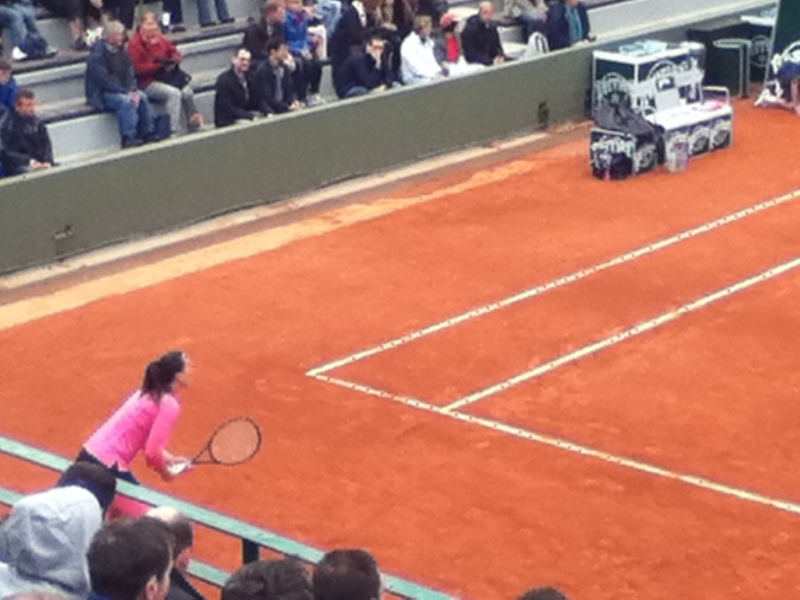 I was in the stands in Court 3 for JJ’s second round bout with Garbine Muguruza for the match’s first three games. Just like she did in Miami in a tough encounter with Li Na, Muguruza impressed me, maintaining great depths on her shots and hitting multiple winners. Meanwhile, JJ wasn’t feeling it, missing many shots she normally doesn’t and adopting a very ineffective, Nadal-esque return stance. I left convinced it was going to be a very tough day for JJ, with Muguruza up 3-0. Of course, as I later found out, Jelena would end up not surrendering another game in a 6-3, 6-0 victory. If that’s not the beauty of tennis, then what is? I just really enjoyed rooting for my fellow Argie in an especially nice-looking court. I’m fairly sure nothing worse than this can happen to a person. Especially on such a crazy cold day (because Paris clearly doesn’t care it’s almost June). The first of the day’s five rain delays (yes, FIVE) came at about 12:40, so 12:40 is pretty much the time I discovered what complete misery feels like. For fans, there is nothing to do and nowhere to go on those occasions (because of the lack of cover) and end up literally just picking a spot to wait at, under their trusted umbrellas. Some even stay on the stands, seated with an umbrella over them, waiting for hours. 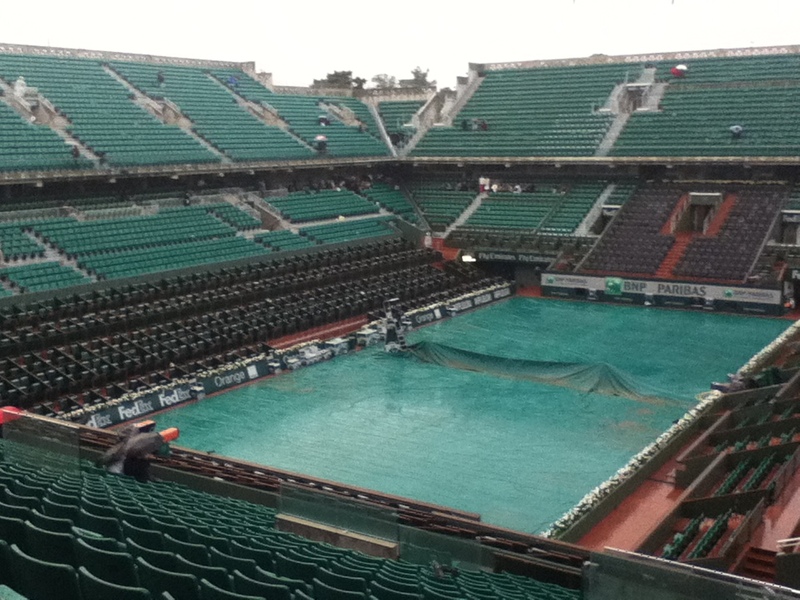 The worst part is actually when the rain does stop and play resumes (the day’s loudest cheers, by the way, were addressed not to the players but to the crew that remove the courts’ covers after it rains) as you are plagued with the worry that it can start to rain again at anytime. All day long, therefore, I’ve kept one eye on the court, admiring the fabulous at hand, and another perpetually on the sky, scanning the sky for troublemaking clouds. Players get a lot of pity for how long they have to wait (aka chill out) in the locker room during rain delays. Maybe it’s time to include cold, wet, ever-so-patient fans in that sentiment as well, no? After the first lengthy rain delay, I made my way to Court 6, to catch the resumption of the all-American clash between Sloane Stephens and Vania King. When I got there, tons of fans were already there. The line judges, the chair umpire and the ball kids were there. Even Vania was there. Yet no Sloane. A good quarter of an hour passed that way, with everyone wondering where she was. Revived, the enthusiastic French fans repeatedly tried slow clapping to somehow summon the American, yet to no avail. Finally, to much applause, Sloane showed. The players had time to play one game before the rain started again. All I ever hear about French fans is how rude/annoying/aggressive/booing-prone they are. While I’m certain this is true in occasions, the fandom I witnessed today was energetic, loud and enthusiastic. Declarations of love were addressed to both Maria Sharapova and Eugenie Bouchard as early as during their warm-up. The fabled wave made its appearance on Chatrier extremely often, even delaying Djokovic from serving once. Indeed, it seemed remarkable that despite the depressing conditions, the fans still managed to create such an involved, lively ambience in all of the courts. Pretty self explanatory. Djokovic was ruthlessly efficient today in demolishing his lefty opponent, but Pella definitely has game, which was a nice surprise. I swear its the only time I ever see her hit conventional volleys and overheads. Not that she needs it, but would it be sin to crank out some swing volleys in her warm-ups? A very expressive fan behind me during the Djokovic match, in response to a lucky net-cord winner off the Serb’s racquet, let out a sigh and a disgruntled, exasperated “oh-la-la.” Luck for Djokovic certainly would not help make the match a more competitive affair. After looking back for one last time at the glorious Chatrier court and making my way out of Roland Garros, I was ultimately very much tempted to apply the Frenchman’s dejected expression to my day as a whole. After all, the day did have its frustrations. The human philosophy that “the-universe-is-a-cruel-place-if-anything-does-not-go-perfectly-during-my-birthday,” which I couldn’t quite detach myself from, didn’t particularly help matters. Yet I found it impossible to depart from RG disappointed. In fact, I left feeling thrilled, feeling thankful. I had gotten to witness inspiring tennis. I had gotten to visit a place charged with history, a place that was the setting of many of our sport’s greatest feats. At the day’s beginning, I had hoped to maintain myself in my own bubble of contentment, yet such a goal turned out to be futile in light of RG’s magnetic field of greatness. Players, as it turns out, are onto something when they say Grand Slams are special. A pleasure to read; you’re a really gifted writer! Thanks so much for sharing your day with us! Lautaro, just wow! Wonder if you are interested in commentating? You would be a much needed breath of intelligent and passionate tennis thinking to the stale and often incompetent on air commentating we have to mute to enjoy matches. I hope to see more on your writing on here! The insight here is excellent.